Want more engagement? Promote what your audience wants, not what you think they want. Note: I also shared this post on my student media blog. When I first started dabbling in social for my college newspaper, I was mystified by a lack of clicks and engagement on things I thought were very important. Elections, scandals and other big happenings saw low response and almost no sharing. 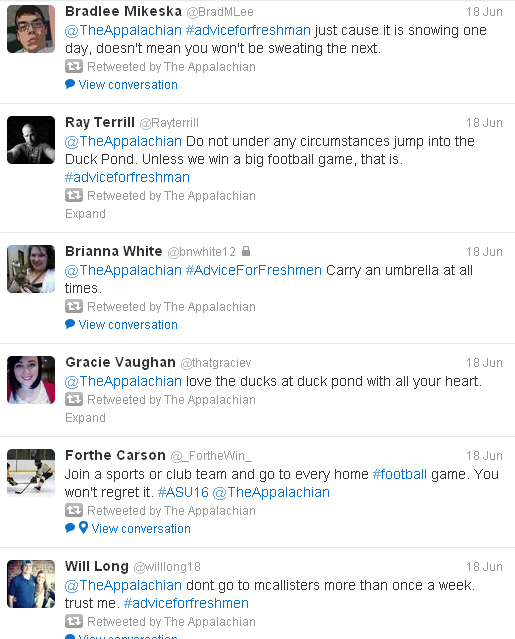 Then, over the summer I started sharing more sports stories. It was mostly out of necessity — our summer updates only focus on big stories, and most of the big stuff going on centered around sports. People loved it. All of a sudden we saw more retweets, more Facebook comments, more interaction. A simple tweet about a baseball player who’d be drafted, for example, saw much more interaction than usual. Then, after noticing it on a few other newpapers’ social sites, I started posting what I’d call feel-good images of the university. 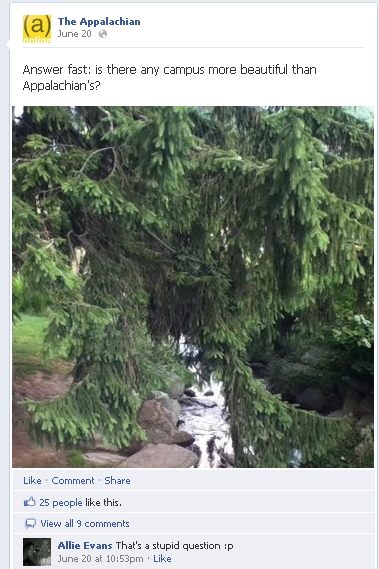 People liked that too — even a simple shot of an on-campus creek generated engagement. The next time I saw major engagement success was similar. 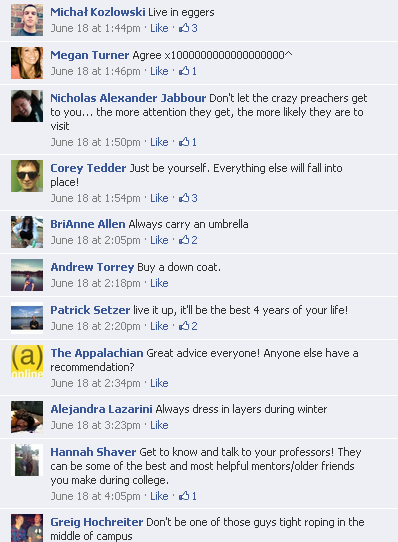 I snapped a photo of an orientation group on campus and asked both Facebook fans and Twitter followers to share their advice for the freshman class. It was a hit. So what’s the lesson? For me, it’s that people share things that make them proud. Social media, for many, is a way to curate the best of their lives — from accomplishments on Facebook to aspirations on Pinterest. You can fit into that, and ensure more virality for your content, by providing social content people want to showcase — like a successful athlete or a gorgeous view. We still get website hits on the “important stuff,” by the way. And we get more website comments on stories you could call hard-hitting than on photo galleries of snow days. It’s not that students don’t care about the “big deal” news. It’s just that our audience uses social in a different way — as a place to curate the good things. So, am I telling you not to tweet when your university president gets fired or the student government does something untoward? Of course not. Even if that was my strategy (and it isn’t) your audience is not my audience. The lesson is to find out what your audience wants and share that, instead of sharing what you think they want. What do you think? Which types of content spread fastest for your media outlet? Leave your answer in the comments. I volunteer at my student paper in England and I’m really interested in how papers interact with their users/readers. One of the most important things that I am learning is that getting the users involved is so important – asking for their views like you did on Twitter is a really fast and simple way to get active readership. Great blog, by the way. Estoy alucinado de haber tropezado con esta Web y poder disponer de tanta información. Thanks fߋr shariing ƴour tɦoughts on . Hello, I enjoy reading alll of your post. I lik to write a little comment to support you. I am going to book mark your site and keep checkinjg for neew dtails about once per week. I opte in ffor your RSS feed aas well. I do consider all oof the ideas you’ve introduced in your post. them a bit froom nsxt time? Thans for the post. much more or figuring out more. Thank yoou for great info I uwed to be on the lookout for this info for my mission. Article Marketing is an effective way tto market your links in adsition to build your title all through tthe internet. copied content or copyright laws infringement? like a lot of it is popping it up all over the web without my permission. Do you know any ways to help protect against content from being ripped off? I read this article completely on the toppic of thhe resemblance of most recent and preceding technologies, it’s remarkzble article.